The Belfast Hub is going full steam and counts with the support, in principle, of most of the people and institutions that engaged in the consultation. However, only 56% were actually content with the proposed. This indicates that people are keen to see a project like this move forward, but it seems the planners didn’t yet get details correct to fulfil people’s needs. 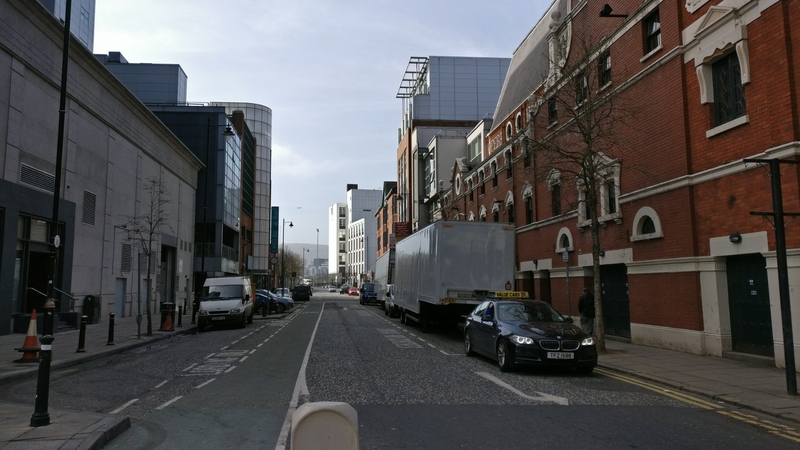 In the last article, a set of shortcomings were identified related to cycling and this publication will delve into one of them, the Glengall St proposal. The current proposal for Glengall St is the usual mixing of pedestrian and cycling together in a shared use path. Placing this two modes of transport together where there is space to do much better is a clear sign of that their needs are being overthrown for the convenience of others. Spot the benefits given to the most polluting mode of transport in detriment of others that are most beneficial to places and society in general. The proposal also comes with an artist’s impression, which provides a look into how the street itself is seen. The road is to be reduced to one-way lane, with parking and loading bays on both sides of the road (wherever possible, it seems). There are also only two cars compared to a much more number of people, which makes one question then why build it for cars? Glengall St Impression – If there are no cars expected, why build for them? The current state of Glengall St is quite dire. It seems a bit of an eerie place, with the back of Europa Hotel and the Opera House pointing there, making it a perfect spot for goods lorries to do their unloading. This street is only accessed by people if they need to either enter the Great Victoria Station side entrance or catch a bus that stops at Glengall St.
People want to quickly be able to pick up or drop off someone. However, will the best way to do it to remove space from streets and from people? Let’s take a look at airports. They all have a quick drop on/off spot or policy (on which some might incur in costs), but they have plenty of space to have them. By contrast, the city centre has almost no area left and such area must be prioritised for people, not cars. The dangers of these “parking” spaces are that we might get traffic that is looking for one of this spots constantly when none is available, generating needless traffic in the street. What about creating a specific area in one of the new proposed car parking? This would make it easier for people who opt to pick up/drop off someone by car to just drive to the car parking, not driving around the area to find a pickup/drop off spot. The same argument as above can be done for taxi ranks. There are already proposed a few in the Durham St. Is there a need for that much more? Taxis journeys are declining in Northern Ireland and while useful they’re not the holy grail. Removing loading bays from one side of the road can increase inconvenience for goods transport workers. It will, however, improve pedestrian space, which shouldn’t need to deal with lorries as much. Another option would be to create loading bays that would also function as sidewalk when no vehicle is there. This has been done in a residential area in the Netherlands. However, I would be very careful with such proposal. The one referenced on the link was for cars and not lorries – which could, in the end, create worse subjective safety for pedestrians. Limiting the number of hours good vehicles can make deliveries will create a greater sense of security amongst vulnerable users. This will also reduce the number of vehicles parked/passing through during the day, making the entire area more livable and a more interesting place to dwell. Ideally, the delivery hours should be retained from late evening to early morning. The best way to prevent unwanted vehicles, both during delivery hours and outside them, is to place physical obstacles. These obstacles must prevent unwanted vehicles, but allow a safe access of movement for all the remaining users. The measures above are only a piece required to give Glengall Still to the people. The intention of them is to allow and attract more investment from existing and new businesses. The sides of both the Europa Hotel and the Opera House can be rejuvenated to provide life to the street. The are already side entrances for both buildings, though they are only used scarcely, as required. Additionally, near the junction with Durham St, there are projected buildings to be constructed. New adequate commerce and investment can also help further develop the area into a place. The decades of car-focused investment brought us standstills and other major issues, like pollution, to the city centre. With blank slates projects, it is a great opportunity to try a new approach and develop for people, to make them feel welcome and belonging without being encased in a metal box. Glengall St is an access road that is currently very hostile towards most vulnerable users. A new approach, while keeping required functionality, for people could revitalise the access from the hub to the city centre. ← The Belfast Hub – What’s in for cycling?